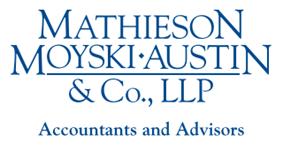 Service to our clients is our number one priority at Mathieson, Moyski, Austin & Co., LLP. Whether that client is an individual, a family, a business owner or a school district finance official, we work as a team to make sure our clients’ needs are met. We understand that the tax and accounting needs of a business owner often flow into his or her financial needs as an individual. That is why many of our clients come to us for both business and individual tax planning. Located in Wheaton, Illinois, we serve clients throughout DuPage County and Chicago's western suburbs with a focus on Wheaton, Glen Ellyn, Carol Stream, Naperville, Warrenville, West Chicago and Winfield. If you have any questions about our services, please call 630.653.1616, and we'll be happy to answer them. At Mathieson, Moyski, Austin & Co., LLP, we are deeply rooted in our community, whether it is participation on a Chamber of Commerce Board, commitment to a service club like the Lions Club, the Rotary Club or the Exchange Club, or dedication to a community organization like CASA of DuPage for Court-Appointed Special Advocates working on behalf of children in the justice system. We understand that giving back is a big part of our responsibility as business owners ourselves. When you hire us, you receive the support of our whole team, from the administrative and support staff to the accountants and partners of the firm. We look for and hire the best and brightest to make sure that our clients receive top quality service. Our partners work closely with the staff to ensure that they receive the professional development that is required to grow our firm in response to the needs of our clients. In February of 1987, Jim Mathieson and Mike Moyski founded the firm. They came to the business with a vision for growing a business in Wheaton and the western suburbs of Chicago, leveraging their entrepreneurial mindset. They saw an opportunity to serve a thriving community and planted their roots in Wheaton. In 1996, Mike Moyski served as a guest speaker on a panel at a Wheaton Chamber of Commerce event and there he met Ron Austin, another speaker at the event. In 1996, Ron joined the firm and quickly moved from manager to partner. Since those early days in the late 1980s to today, Mathieson, Moyski, Austin & Co., LLP has expanded to a firm of over 20 people. Partners and staff are deeply entrenched in the community and participate in business and civic activities and events. The spirit of the firm reflects its entrepreneurial roots, independence and commitment to the success of our clients.